If you’re after Italy property and real estate for sale, then get used to a whole new language. You’ll know what a villa is, and you can work out appartamento, but what about the bilocale, casetta or terratetto? A complete glossary of types of Italian property and real estate. If you’re British you’ll be used to buying property in certain sizes — detached, semi-detached, terraced or a flat. American readers will be used to purchasing their real estate in the shape of apartments, condos, villas or duplexes. But you’re buying Italy real estate so you’d best acquaint yourself with a whole new vocabulary — we wouldn’t want you purchasing a stable when you meant to purchase a mansion. An appartamento is an apartment of course, or a flat to UK readers, while a bilocale is an apartment with two rooms. Maybe you want to buy a regular house in Italy? Casa is the generic term for a house or home, with a casetta a small house, not to be confused with either a casale (a farmhouse or small hamlet) or a castello (castle). Sub-genres of the casa include the casa bifamiliare (known to Brits as a semi or as a duplex to Americans, and the casa canonica (a vicarage or minister's house — unsurprisingly often found next to the local church). Terratetto, meanwhile, means the owner owns the entire buildings, from 'roof to ground' and it may be a semi-detached, detached or terraced house. Don’t confuse the casa canonica with a casa colonica. This latter is a farmhouse, while a casa padronale is the main house on an estate, the old squire’s house. Those new to buying Italian property shouldn’t be misled by the phrase ‘palazzo’ as this can be applied to almost any large apartment building or block of flats, as well as it meaning a large town house or mansion. Italian real estate agents are as enthusiastic as any at talking up their property for sale. That doesn’t mean you won’t want to buy an attico (attic), a mansarda (loft conversion) or a monolocale (a studio flat … or bedsit as we used to call them); just be aware that you’re not purchasing a villetta a schiera (terraced house). While you’re negotiating on your property for sale in Italy, by the way, find out if a box is included … that’s a prefabricated garage. You may also have a torre (tower) attached to your dwelling. And as you’ll very likely be looking at buying real estate in the Italian countryside, there’s a whole new glossary to grasp. A farmhouse may also be referred to as a cascina, while a house in the country will be dubbed a casolare. The farm may be a fattoria (working farm) or increasingly an agriturismo (a working farm offering accommodation). 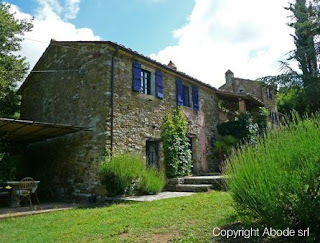 Depending on the condition of Italian property for sale it may be listed as a rustico (rural property, usually in need of modernisation) or a rudere (an abandoned ruin). Farms vary in size of course, from the masseria (a huge estate, usually in southern Italy) to a podere (a smallholding that may keep you in meat, fruit and vegetables). Other regional variations include the maso (a farm in the far northern and sparsely populated Alto-Adige region) down to the trulli … the startling cone-topped stone dwellings in Puglia in the south. Trulli for sale are becoming increasingly sought after. If you’re buying an Italian farm, by the way, you may well find yourself the proud owner of a stalla (stable), a fienile (hay barn), capanna (barn) or a dependence (outhouse). An annesso meanwhile is the annex. All, of course, may be ripe for conversion to accommodation, though a porciliaia or porcile likely not … that’s the pigsty.